I tore through In The Name of God (Roaring Brook, April 2007) as a reader first (during yet another crazy time in the history of violence), led effortlessly by Paula Jolin's suspenseful plot, vivid characters, and fascinating details about teen life in Syria. Afterwards, though, the buried high school teacher in me came roaring to life, keeping me up late with ideas about how to use this book like mad in the classroom. We'd read the book, for example, and then my students would pick three historical events in the last fifty years and describe them first in the voice of Nadia, and then through the eyes of an American teen who joins the Marines to fight terrorism. Or I'd get the kids discussing what they might be willing to die for and why. And so on ... how Jolin manages to create a sympathetic suicide bomber in the making is a literary study in itself. Tell us about the journey to getting the book published. What was a high point? A low point? I wrote In the Name of God in ten weeks in the summer of 2004. After that, I revised for nearly seven months - well, no, after that, I jumped the gun with the agent search, got a few form rejections, submitted to my critique group and then realized I needed to revise! In the spring of 2005, I sent off ten queries to agents on a Friday, and that Monday my daughter was born (a month early.) Let me tell you, there's nothing like having a baby to take your mind off the agent search. When I came home from the hospital, there was a letter in my inbox from my agent-to-be and I just looked at it, a little woozy, and thought: who is this person? My agent search was relatively painless and at first it looked like publication was right around the corner. We got a lot of initial interest and a flurry of encouraging e-mails. But then came the rejections. Many felt In the Name of God was too controversial, although others claimed that "American teens won't read books set in foreign countries." I almost gave up in despair. My agent talked about - maybe - selling other projects and coming back to this one later. When the editor at Roaring Brook wrote how much he liked it, I didn't even get excited. I'd been there too often before. But a week later he made an offer! And, well, I guess that was the high point. After that, of course, came the hard work of getting the book into publishable shape. What was the biggest (hardest) change you made in response to an editorial suggestion? In the original version of In the Name of God, there were a number of scenes involving Nadia and her fantasy life, where she pretended to be an American girl. When I lived in Syria, I knew many girls who had conflicting feelings about the US. One close friend of mine covered her hair and was very angry about US policies supporting Israel, for example, but she loved the movie Titanic and had seen it 19 times! I didn't see this as a contradiction, just that she was a multifaceted person, and I wanted to give Nadia that same kind of mutlifaceted personality. However, as we all know, sometimes reality doesn't transfer to the page all that well. My editor thought that we should take this subplot out, both because the scenes were outside the developing plot, and therefore cut the escalating tension, and because he thought it was confusing. I loved this subplot; this was one aspect of myself I put in Nadia - I had imaginary friends until I was 35 (okay, I confess, I still have them!) and I really didn't want to cut it, so I asked a bunch of people who had already read the book, and I noticed something very interesting. The readers who were also writers loved those scenes, but the readers who weren't writers agreed that they were confusing. Since the book was targeted to readers, I cut. It wasn't a huge amount of work, but it nearly broke my heart. Now, almost a year later, I have to say I think the book is smoother this way, and it's point comes across clearer and more effectively. I still regret the loss a little, but I know it made In the Name of God a better book. My first suggestion is to let the story come out of your interest, and not the other way around. If you're fascinated by a culture and a language and a people, and you spend a lot of time indulging that interest, then I think when you come up with a story, it'll seem natural and authentic. 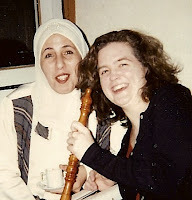 I lived in the Middle East for years, not because I wanted to write novels about it, but because I loved the friendliness of the people and the complexity of the language and the intricacies of the culture. I used to say it was wonderful living in a place where you'd go out to buy bread and come home with an adventure. Later, when I started In the Name of God, I was able to write so much of it out of my own experience. And one of the most striking things you learn, when you live in another country, is that people of different cultures are just as diverse as Americans - with political opinions, and values, and lifestyles - and I think it's important to incorporate that into any book set in a culture other than your own. You have such rich, complex experiences in your own culture - you should try to remember that, I think, when you're creating characters and setting them in another part of the world. If you find that all your foreign characters have the same opinions, or that they follow set patterns or that you're using them to make a point, well, then that's a problem. In the climax of some YA novels set in non-western places, a white outsider rides in and saves the day. This doesn't happen in your novel, but we do see and/or hear about foreigners in the story. Would you comment on the role they play in the book and why? Nadia and her family talk a lot about foreigners, although they frequently get things wrong. I wanted to show how pervasive American culture is in other parts of the world — and, at least in the Middle East, how American policies sometimes make a concrete impact on how people live. American sanctions in different parts of the region affect how many people can find jobs and what kind they are, for example, and these kinds of things limit Nadia's brothers and ultimately affect her too. The policies that we vote on here often have far reaching effects, effects we don't see directly. And yes, that includes the war. Nadia is more radical than most of her family and friends, but it's not only Nadia who feels that the war in Iraq is terribly invasive and wrong. It's made people more fearful, more worried, more distrustful of the US. Nadia and her friends know a lot more about the US than the average teenager here knows about Syria — how many Americans can name the president of Syria, for example? Or five popular Syrian entertainers? — but at the same time, since their information comes almost exclusively third hand, from the TV, from magazines, from books, from the internet, a lot of time they get it wrong. And I hoped that maybe if readers could see how wrong other people can be about us, then maybe they would start thinking about the assumptions we too make about people from other parts of the world. Describe a fear you have about this book that can keep you up at night. Originally I was worried that people would be so turned off by the premise that no one would buy the book! Later, I worried that people would misinterpret it, would think somehow that I supported suicide bombings or was sympathetic to them. More recently, I've been wondering if I did Nadia's story justice, if I was really able to convey the conflict she felt, able to walk that fine line between creating a sympathetic character and depicting a real girl who makes bad choices. Okay, I admit it, I worry a lot! Finish the sentence twice, first from an idealistic "literature changes lives" point of view and then give the savvy marketer's take. a) readers feel closer to and more invested in the conflict in the Middle East. b) readers who like suspense books with an underlying serious theme are looking out for my next book. What's next for Paula Jolin in the realm of children's books? My second book, Three Witches, comes out next March. On the surface, it's a very different book from In the Name of God. It's the story of three American girls from different backgrounds - one is originally from Syria, one is an immigrant from Trinidad, and one is Japanese-American - who try to use the magic of their different cultures to raise a boy from the dead. While it's not a political book, obviously, Three Witches is a book about belief, and how the things that you believe can change who you are; it's also about wanting things very badly, and how far you're willing to go to get them. In this sense, it does still pick up on some of the themes that I explored in In the Name of God.